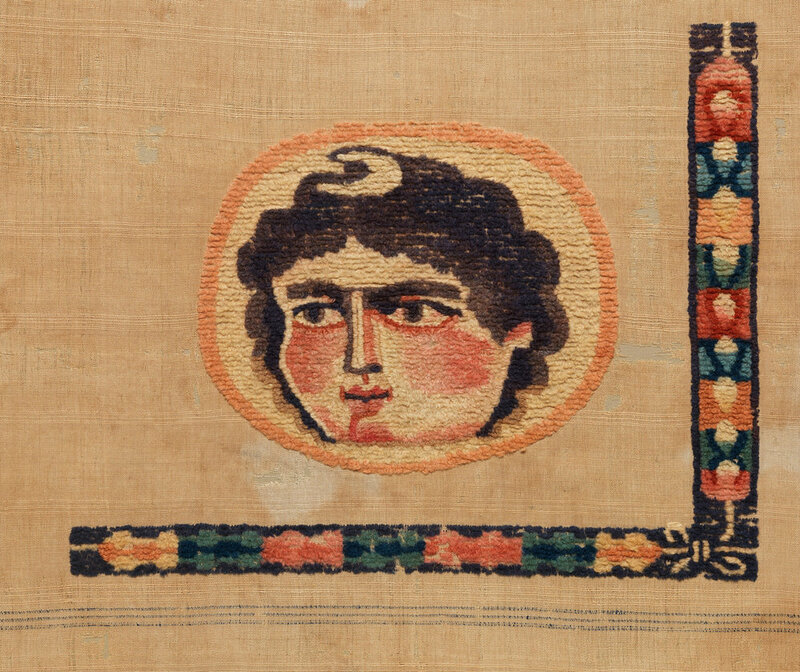 The extremely wide variety and peculiar intrigue of the subject matter depicted in Coptic textiles is owed to the era’s massive churning of belief systems and the resulting changes in daily life and visual culture. In this last stage of what is considered to be Ancient Egypt, ranging from the 3rd-7th centuries and encompassing both Late Roman Egypt and Byzantine Egypt, Greek and Roman pagan beliefs were beginning to be dominated by Christian influence and new styles developed accordingly. Predating the Islamic influx in the region, aesthetic foundations were laid that were later incorporated into additional shifts that identified Islamic art. A 5th-6th Century fragment for sale through Christie’s. 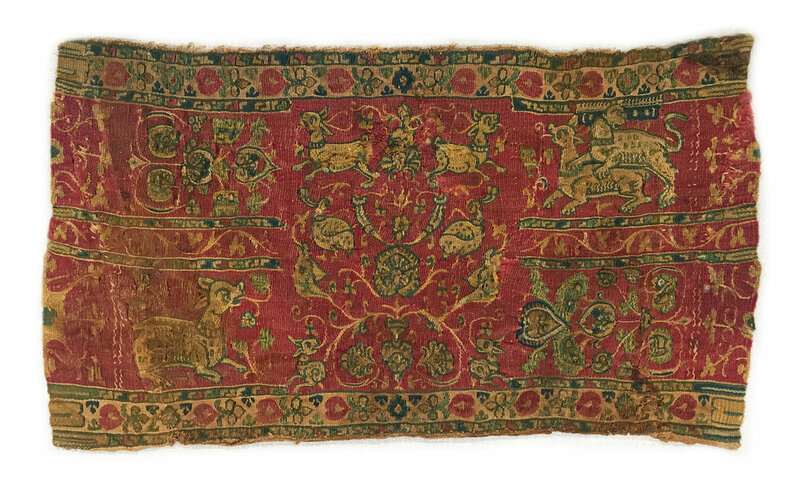 The value of textile as a material at the time is evidenced by the apparent reuse of many pieces that have been discovered. 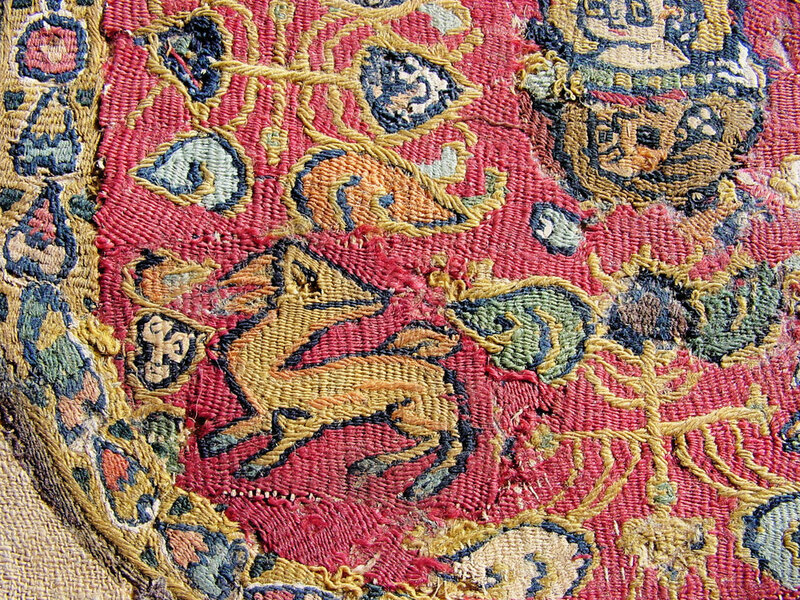 Areas where decorative sections have been cut out of an original fabric to be applied to another are a common characteristic of the remaining fragments. Initially manifesting as more stately, larger forms such as curtains, rugs, and tunics, the fabrics would eventually become scraps. The fate of these scraps likely depended on their quality, ranging from reapplication on another tunic down to mere rags and even diaper cloths. Fragment with “Inhabited Vine in an Eight-Pointed Star,” 5th-6th Century. From the Metropolitan Museum of Art. 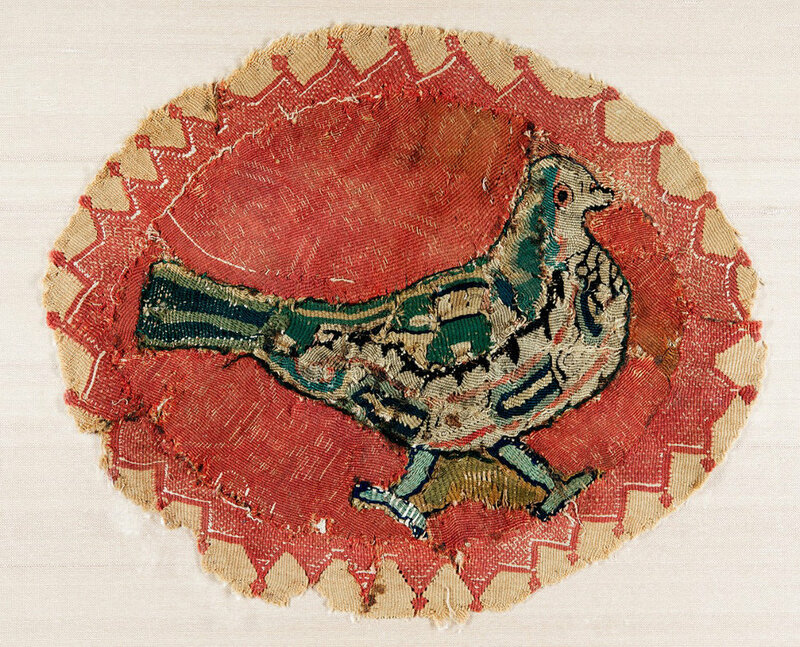 Image of 6th Century Roundel from Love to Know. Roundels like this commonly adorned the shoulder areas of children’s garments. Examples in the European regions were lost to disintegration due to the moister climate—it is those that remained in the dryness of Egypt that have survived. Thankfully, the Egyptian practice of burying the dead in cloth garments and wrappings was adopted by Christians, providing the best preserved examples of these textiles that remain today. From these remains, many of the more valuable sections were cut out and sold—perhaps lost forever, due to the antiques’ delicate nature. A fragment from the Eton Meyers College collection, currently shown in the Roman House at John Hopkins Archaeological Museum. Many of the tapestries display “eccentric wefts,” or wefts that do not pass over and under the warp threads in a straight, ninety degree angle. 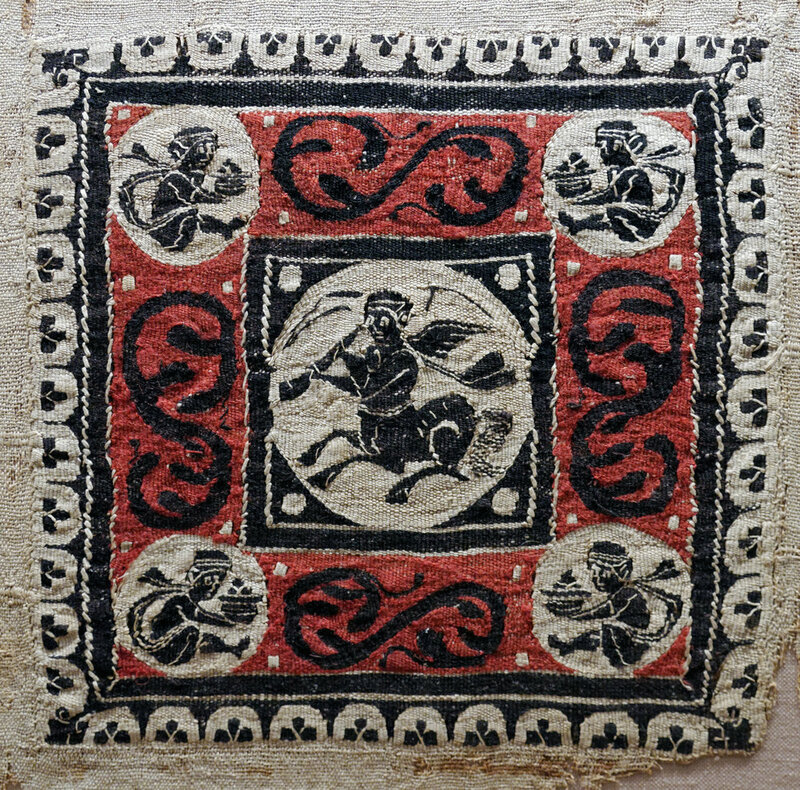 This technique, commonly used in the tapestries of late Roman Egypt, allows for unusual, shapely pathways in the weaving, providing more freedom for the weaver’s rendering. From the 6th-8th Century, available through Christie’s. Greek mythology is on display in this fragment from the 7th Century, depicting a Centaur and Erotes, part of the entourage of Aphrodite. From the Metropolitan Museum of Art. A fragment from the 3rd-4th Century depicting a Goddess, from the Metropolitan Museum of Art. Image from Hyperallergic. A sleeve band depicting a paradise garden, 4th-7th Century. Gift of the Estate of Rose Choron, Godwin-Ternbach Museum. Fragment detail, from The Hermitage Museum. From the Tellalian Collection at Boston College. Detail of a fragment from the Metropolitan Museum of Art, late 3rd-5th Century. From an aesthetic perspective, the bold blocks of color, intertwining, geometric compositions, and stark contrasts instantly drew me in to learn more about these textiles. However, it was really the small decorative details that enchanted me—no surprises there! I find the borders and small, ground-filler motifs to be so charming. There’s nothing like tapestry weaving to give a simple shape the nuance needed to become a precious object, especially when thousands of years contribute inimitably delicate textures and timeworn hues. Fragment from the Detroit Institute of Arts Museum. Fragment in pieces, 5th Century, from the Metropolitan Museum of Art.